Champion trainer Paul Nicholls and jockey Daryl Jacob put a Festival of frustrations behind them when Lac Fontana brought up a final-day first. The five-year-old had gone up 12lb for winning at Cheltenham in January, but that could not stop him producing a winning run along the stands' rail that carried him to victory by half a length from Arctic Fire. Nicholls was quick to praise his jockey, and said: "Daryl has been a bit down, but all you need is a bit of luck - he'll be a totally different guy now. I'm chuffed for him - he needed a winner. We've been unlucky but that's just the way it is here. Little margins can go wrong and you don't end up on the scoreboard, but we're on it now and so we're happy. "I knew Lac Fontana would gallop all the way to the line, but the way things have been going I feared we would be beaten in a photo finish, but that was just what we wanted. "Going up 12lb wasn't ideal, but I felt he had a bit in hand the last time he ran and I was more worried about the ground and whether he would be outpaced. They went quick and he managed to stay with them and was really strong from the back of the last. I suspect he will run again at Aintree, and probably in a novices' race - the handicapper will put him up for this so we'll look at a novice, but I wouldn't want to take on Vautour if we went to Punchestown. Really he wants a bit further. "He finished eighth in the 2013 Triumph Hurdle, but he finished the season a maiden and that was probably a good thing. Novices have a good record in this race." 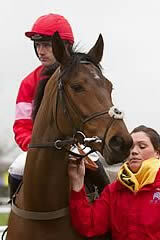 Nicholls retired Big Buck's yesterday after the 11-year-old finished unplaced in the Ladbrokes World Hurdle. The trainer said: "Things are all good. I could see after three or four hurdles yesterday that all was not well - he was a bit short and choppy which can happen when they've had leg trouble. I knew it was game over fairly early on. "He's been a legend. We're going to carry on cantering away on him for now and then give him a summer off. Who knows, I might hunt him in future." After a testing week, jockey Daryl Jacob got on the scoresheet for the 2014 Festival with Lac Fontana. "It has been a very testing week for us all. Firstly, I would like to say a big thank you to Fitzy (Mick Fitzgerald). He has been a great friend of mine and an even better jockey coach to me. He has been unbelievable to me," said Jacob. "We are all thinking about the boys who are injured - Jason (Maguire), Bryan (Cooper), Ruby (Walsh) has got hurt now and JT (McNamara). This is a special place and we don't want to forget about the people who mean a lot to us. "I just wanted to keep my head down, keep working - the one thing I will do is keep grafting and fight for all I can. "It's been a tough week and it's great to come away with one winner. You've just got to keep looking forward. Maybe at night you look back and think 'what if' but not during the daytimes. "It's a big relief, we've hit the crossbar a few times and been unlucky. I've been bumped a few times in races and it's one of those things. "He jumped off and had a great position then I found myself a little flat-footed the whole way down the back straight but he's very tough and kept pulling out more all the way. We were flat to the boards a lot of the way but he's got a big heart and a will to win." Jacob's stirrup broke on fourth-paced Calipto, the 11/2 favourite, in the JCB Triumph Hurdle and he added: "I don't know why it happened, I had new stuff this week and maybe it was a faulty leather. Davy won well so I don't know what would have happened but I'd have definitely been in the shake up." Arctic Fire, ridden by David Casey and trained by Willie Mullins, ran a huge race for such an inexperienced horse when going down by half a length to Lac Fontana. The 7/1 second favourite has only had four starts over hurdles to date but belied his novice status to finish best of the rest behind the 11/1 winner. "To be second at The Festival is a bit frustrating but he's run a blinder," said Nick Peacock, owner of Wicklow Bloodstock. "We have been waiting for this sort of ground and hopefully Punchestown or Aintree will come into the equation after this." Wicklow Bloodstock also owned the fourth horse home, Diakali, and Peacock was also delighted with his performance under Danny Mullins. "He's run a massive race under top-weight and we're very happy with him," said the owner. A trip to Scotland could be on the cards for Montbazon after the 20/1 shot finished a further length behind Arctic Fire in third. "We've got to be happy with that run," said trainer Alan King. "The Scottish Champion Hurdle up at Ayr could be the plan for him now I think - we like our little trips up there."